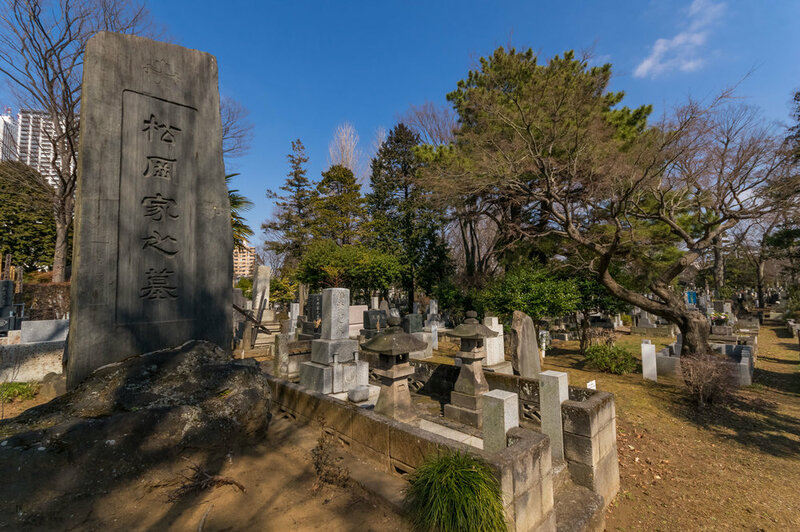 Another one of my favourite places to walk and photograph in Tokyo is Zoshigaya cemetery. 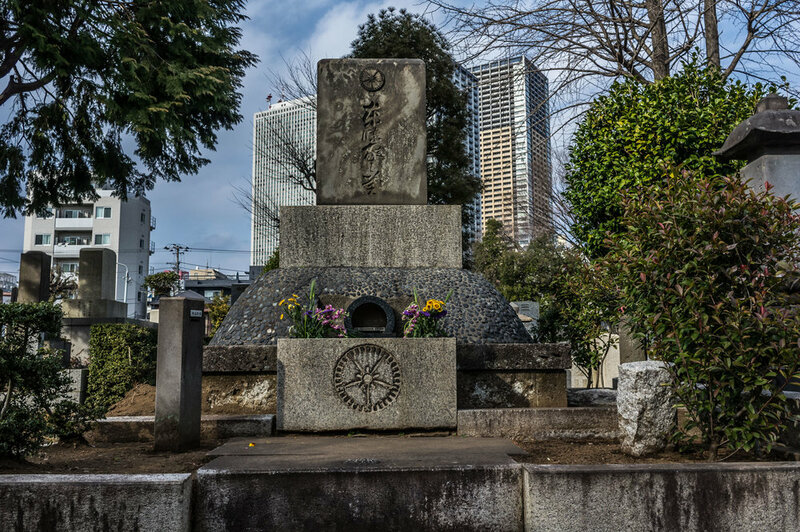 Zoshigaya is a very important place as it contains the graves of some of Japan’s most historically important people as well as many of its rich and famous. I’ve been there many times and enjoy it immensely. If you spent a little time there, I’m sure you’d be equally impressed. The cemetery quite large, over ten hectares and is non-denominational so don’t be surprised seeing a lot of Christian crosses there. From within the cemetery you can easily see the famous Sunshine 60 building and other skyscrapers near Ikebukuro station. It is a great looking skyline, especially early or late in the day. Zoshigaya is peaceful and quiet. However, to be honest, to look at it on Google map from above gives the impression that everything is nicely arranged, but to be actually there, viewing it from ground level, from my eye at least, it looks rather cluttered. True, the graves are all in rows, but the size of each varies as do their heights so walking through it feels like walking through a jigsaw puzzle. And there are lots of trees. Sometimes I think the designer found a forest he liked and thought it was a good place for a cemetery. He didn’t landscape it, didn’t move any trees to make way for the graves. It feels as though he wanted to keep it as natural as possible, so he kept the trees and just squeezed some of the graves in between the trees. There is nothing landscaped about Zoshigaya. The graves there are of course, very interesting. Some are very simple, like Takahisa Yumeji’s, just a sculpted rock while others have the more typical tall rectangular block type that are common throughout Japan. You’ll find others that are dome-shaped. A few even have their own private gardens or even hedges. Others are quite large. There are other quite large plots occupied by what could only be called mini-mausoleums, which are very impressive. 5) John Manjiro - real name, Manjiro Nakahama, one of the first Japanese to visit the United States and was later an important translator. Other graves of the not-so-famous there don’t give anything away. Many of them are brilliant in either design or their epitaphs. You'll even find a couple of them have something witty written on them in English, while others might have an unusual gravestone. One great example is made of white marble with pink cherry blossom petals carved into it. Next to many of the graves there are ornamental lanterns, pagodas and even angels. Some also have a place into which business cards can be placed to let families know when someone came to visit the grave. I think Zoshigaya is a great place to visit as it could keep you occupied for many hours. If you wish to visit the cemetery to see a specific grave, the office has maps and some of the staff speak English (to various skill levels). Unfortunately, the map only has a few of the famous people listed and all of it is in Japanese, which is a real pity. A signboard near the office has about ten graves of famous people marked on it, in Japanese and English, but it only has the rough locations. But please don’t let the lack of English signage hold you back from going as it is a great place to visit. You can see its website here. There are two ways to get there. One is by Toden Arakawa Line’s streetcar (it`s website can be seen here). You can see the cemetery from the platforms. The other way is by subway, either the Fukutoshin or Yurakucho lines. For the Fukutoshin line, get off at Zoshigaya station (exit 1) and it`s about a 5 minute walk. If you use the Yurakucho line get off at Higashi Ikebukuro station and it`s about a 10 minute walk (to be honest I haven’t used this one though). The administration office is open from 8:30am to 5:15pm and its telephone number is 03-3971-6868. The cemetery itself is open 24 hours a day.